Philip Henry Niekro (pronounced NEE-kro) (born April 1, 1939), nicknamed "Knucksie", is a former Major League Baseball (MLB) pitcher. He played 24 seasons in the majors, 20 of them with the Milwaukee / Atlanta Braves. Niekro's 318 career victories are the most by a knuckleball pitcher and ranks 16th on the overall all-time wins list. He won the National League (NL) Gold Glove Award five times, was selected for five All-Star teams, and led the league in victories twice and earned run average once. Niekro was also a key to the only two division titles Atlanta won before 1991. Phil and his brother Joe Niekro amassed 539 wins between them, the most combined wins by brothers in baseball history, and Phil's 121 career victories after the age of 40 is a major league record. His longevity is attributed to the knuckleball, which is a difficult pitch to master but is easy on the arm and often baffles hitters due to its unpredictable trajectory. Niekro was the last MLB pitcher to have both won and lost 20 or more games in the same season. With the 1979 Braves, Niekro finished with 21 wins and 20 losses. This was his third and final 20-win season and his second and final 20-loss season. That season, Phil and Joe Niekro were National League co-leaders in wins. Niekro was born in Blaine, Ohio, and grew up in Lansing, Ohio. He attended Bridgeport High School in Bridgeport, Ohio, and was a boyhood friend of Basketball Hall-of-Famer John Havlicek. The baseball field on which he played at Bridgeport High School's Perkins Field athletic complex was renamed "The Niekro Diamond" in 2008 after both Phil and his brother, fellow major league pitcher Joe Niekro. The brothers were the sons of a coal miner who had pitched semipro baseball and had learned to throw a knuckleball from another coal miner. He later taught his sons the pitch in their backyard while they were kids. In addition, Phil played American Legion Baseball growing up. Niekro debuted with the Milwaukee Braves in 1964, working 15 major league innings and spending time with the team's class AAA minor league affiliate. He stayed with the major league team all year in 1965, appearing in ​74 2⁄3 innings in 41 games and recording six saves. In 1966, Niekro split time again between the Braves and their minor league system, going 4-3 with a 4.11 earned run average (ERA). Niekro led the league with a 1.87 ERA in 1967, earning an 11-9 record with 10 complete games and 9 saves. He had begun the year as a relief pitcher but had earned a job in the starting rotation during the season. Before the 1968 season, sportswriter Fred Down described the Braves' pitching staff as "chaotic" and reported that team leadership was planning to use Niekro as both a starter and a reliever in the coming season. He appeared in 37 games, finishing with a 14-12 record and 15 complete games. He appeared in relief three times, earning two saves. In 1969, his first All-Star season, he had a 23–13 season with a 2.56 ERA, finishing second in Cy Young balloting to Tom Seaver. The Braves went to the playoffs, where Niekro was 0-1 with four earned runs allowed in an eight-inning appearance against the New York Mets. Niekro's playoff loss came against Seaver. The team was eliminated from the playoffs after losing the next two games. In 1970, he went 12-18 with a 4.27 ERA in what turned out to be a down year. He surrendered a league leading 40 home runs that year, a feat he wouldn't repeat until 1979. From 1971-1973, he combined for a record of 44-36. The Braves finished 3rd, 4th, and 5th in their division respectively. On August 5, 1973, Niekro threw a no-hitter against the San Diego Padres. The no-hitter was the first for the Braves after moving to Atlanta. In 1974, Niekro led the league in several pitching categories, including wins (20), complete games (18), and innings pitched (302.1). He finished third in the voting for the Cy Young Award that year. From 1975-1976, he went 15-15 and 17-11 respectively while making a second All-Star appearance in 1975. Between 1977 and 1979, Niekro was the league leader in complete games, innings pitched and batters faced. In 1979, the 40-year-old Niekro led the league in both wins (21) and losses (20). He finished sixth in Cy Young Award voting in both 1978 and 1979, and made his third All-Star appearance in 1978, as well as winning three consecutive gold glove awards from 1978-1980. From 1980-1981, he went 15-18 and 7-7 respectively while leading the league in games started (38) and losses (18) in 1980. In 1982, at the age of 43, Niekro led the team with a 17–4 season while winning his fourth gold glove and appearing in his fourth All-Star game. On October 1, with the Braves clinging to a one-game lead over the Los Angeles Dodgers, Niekro beat the San Diego Padres almost single-handedly by throwing a complete game shutout and hitting a two-run home run. Niekro started Game One of the subsequent NLCS against the St. Louis Cardinals and pitched well, but the game was called on account of rain just before it became official. He pitched six innings of Game Two and left with a 3–2 lead. However, the Cardinals scored two late runs after Niekro left the game and would eventually sweep the series. In 1983, he went 11-10 and won his fifth gold glove. After the season, the Braves released him. In 1984, he signed with the New York Yankees. He went on to win 16 games and make his fifth and final All-Star appearance. On October 6, 1985, Niekro gained entry into the 300 win club with a shutout win over the Toronto Blue Jays. At 46 years, 188 days, Niekro became the oldest pitcher to pitch a shutout in the major leagues. This record stood for nearly 25 years before Jamie Moyer (47 years, 170 days) bested the feat in May 2010. He did not throw his trademark knuckleball throughout the game until the final hitter, former AL MVP Jeff Burroughs. Prior to facing Burroughs, Niekro's teammate and brother Joe visited the mound in the role of "substitute pitching coach" and jokingly suggested that an intentional walk was in order. Instead, Niekro struck Burroughs out to end the game. He finished the 1985 season with a 16-12 record, the final time he won 15 or more games in a single season. He was released by the Yankees before the 1986 season started. After two seasons in New York, Niekro pitched for the Cleveland Indians in 1986. He went 11-11 in 32 starts. He started the 1987 season with the Indians, going 7-11 in 26 starts. On August 9, 1987, Niekro was traded to the Toronto Blue Jays for Darryl Landrum and a player to be named later, who was later revealed to be Don Gordon. After going 0-2 in 3 starts, the Blue Jays released him. On September 23, 1987, Niekro signed with the Atlanta Braves. On September 27, he made his final start of his career, going 3 innings and surrendering 5 runs in the no-decision. The Braves lost the game against the Giants 15-6. Niekro retired at the end of the season. At the age of 48, Niekro was the oldest player in major league history to play regularly until Julio Franco played at age 49 in 2007. He set a major league record by playing 24 seasons in the major leagues without a World Series appearance. His total of 5,404⅓ innings pitched is the most by any pitcher in the post-1920 live-ball era. He only appeared in the postseason twice, making a playoff start in 1969 and again in 1982, both for Braves teams that lost the series. Niekro was elected to the Hall of Fame in 1997, his fifth year of eligibility. He was the only player elected that year; Tony Pérez and Don Sutton were among the notable players who were not elected. After he was notified, Niekro said, "Giving a description of today's phone call is impossible. I've been stunned before. I just didn't prepare myself this year. I was not going to get myself so high." The year before, Niekro had received the most Hall of Fame votes out of all the players in the ballot, but had not received the required 75 percent of votes for election. The Gwinnett Braves' stadium has a restaurant named Niekros after him; it features the Knucksie Sandwich made of barbecue and cole slaw atop a corn muffin, said to be his favorite. Phil and his family have continued to support the students of Bridgeport High School with the proceeds from the annual golf tournament "The Niekro Classic". ^ a b c d e f g h i j k l m n o p Phil Niekro Statistics and History. Baseball-Reference.com. Retrieved January 17, 2015. 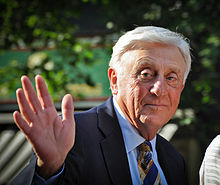 ^ "Phil Niekro Goes Home to Visit His Ailing Father". Los Angeles Times. September 30, 1985. Retrieved November 1, 2013. ^ a b c "Phil League Minor League Statistics and History". Baseball-Reference.com. Retrieved January 17, 2015. ^ a b Down, Fred (February 27, 1968). "Harris planning dual role for Phil Niekro". Rome News-Tribune. Retrieved January 17, 2015. ^ "1969 NLCS". Baseball-Reference.com. Retrieved January 17, 2015. ^ Quinn, T.J. (September 2003). "Road to 300: with Roger Clemens becoming the 21st pitcher to win 300 big league games, here are the stories of seven others who reached the same milestone". Baseball Digest. Retrieved November 4, 2008. ^ Smith, Claire (October 7, 1985). "Niekro Gets 300th Win--a Shutout of Blue Jays". Los Angeles Times. ^ a b c "Phil Niekro Trades and Transactions". ^ "Ralph Kiner Quotes". Baseball Almanac. Retrieved November 1, 2013. ^ Clark, Dave (2012). The Knucklebook: Everything You Need to Know About Baseball's Strangest Pitch—the Knuckleball. Ivan R. Dee. p. 74. ISBN 1566639700. ^ a b "Phil Niekro enters Hall alone". The Nevada Daily Mail. Associated Press. January 5, 1997. Retrieved January 17, 2015. ^ Smith, Claire (January 8, 1997). "Coal Miner's Gift Is Treasured by Son". The New York Times. Retrieved November 1, 2013.